Inspired by Christian Louboutin’s intimate moments shared with fans from around the world, and his on-the-spot drawings, the Loubitag Nail Collection showcases one-of-a-kind artwork hand-drawn by the creator, who has morphed his shoe-centric empire into a legit beauty brand. The renowned shoemaker’s beauty line has opened a corner at the Milan’s central Rinascente department store with many other locations sure to follow. 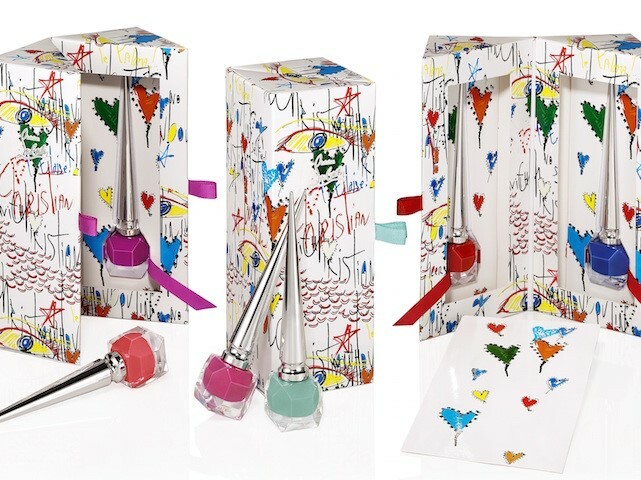 Each of the three limited edition duo sets is presented in a beautiful origami-like collection box and offers two miniature bottles of Nail Colour shades from the Pops collection (little known fact, it was the red nail polish of one of Louboutin’s assistants that inspired his now trademarked red sole bottoms.) Loubitag Collection I is made up of Pluminette, a daring hot pink, and Batignolles, a willow-green blue. Loubitag Collection II includes Miss Loubi, a vibrant coral pink, and Bolidonna, a bright berry violet infused with red. Collection number III includes Edgypopi, a flirty and punchy orange-red, and Baraboum, a vivid royal blue. Collection available at Nordstrom, Aventura Mall.